Keira turned 10! As we usually do, we planned a special cake for her. I found a carousel bundt pan. Avalyn made a Gluten Free pound cake using the pan. Unfortunately, the cake wasn't dense enough to show the intricate shapes of the pan, but Keira still liked it. God is amazing in how he has showed us his watch care over Keira. With all of her early health concerns, she is really healthy. She works hard at her school work. But most of all she loves horse back riding! God has graciously allowed her to grow and learn and has showed us himself in the struggles. We dusted the cake with powdered sugar in hopes that it would help the shapes on the carousel stand out. It didn't work very well, but the cake tasted really good! And the powdered sugar made blowing out the candles more fun! Each of the kids bought Keira a present and she enjoyed opening all the gifts. We started school on August 1. We wanted to get a start on the year so that if things came up, we would still be able to have a summer vacation! The kids were ready to start and I was ready to get back into a routine. Keira sorted money. She was very diligent and wanted to go sort our coin jar when she finished with the toy money! Avalyn asked if she could help Sophia start her math. Sophia started Alpha Math U See and was really excited about it! Kyle worked hard on his math: Gamma - Math U See. I was looking back, and the last exclusively sewing post was for April! I didn't do much sewing in May, with NO pictures of fabric. I put together some fabric in June, but I didn't do much sewing. July was the first month of more sewing! I wanted to use the summer to get so sewing done, but until July, I didn't really get the chance to sew much. That is fine, since family life is more important than any sewing project! With the Mighty Lucky challenge, I worked on April's project. It was interpreting a photograph into a quilt. If you think that sounds challenging, in practice it is much harder! It took between 12 and 15 hours of sewing to get my "block" which could really double as a small quilt. I used a picture Adrian took of an orchid from our first trip to the Atlanta Botanical Garden. I never knew I liked orchids until that trip! This is the picture I based my quilt block off of. And this is my translation of that picture into a quilt block. Every time I think about this particular challenge, I think of a quote from one of my favorite quilters Lynn at the Patchery Menagerie. She says, that recreating pictures into quilts does not use the medium well. She likes to use quilting to convey other ideas, not recreate pictures. I tend to agree that the medium is not conducive to reproducing paintings or photographs, but I like the idea of interpretive or stylized pictures and may try this again some day. In any case, it was an interesting challenge and definitely pushed me out of my comfort zone. 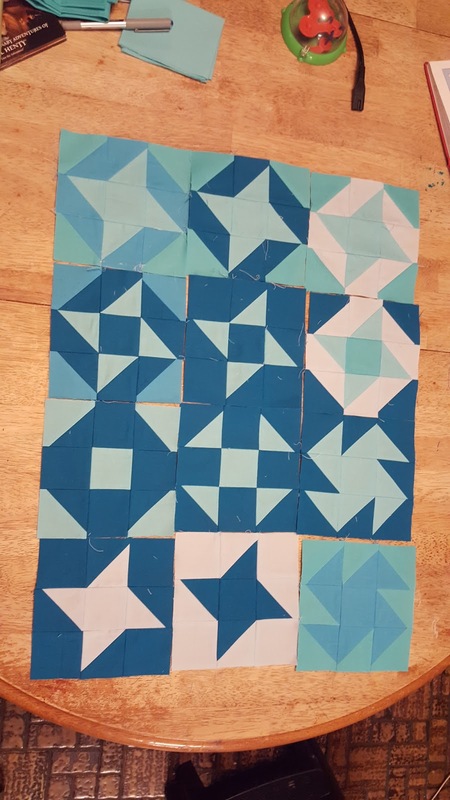 Here are my first four blocks together. April's block is almost as big as January's and Febrary's blocks put together! I started on the May challenge as well! It is about color contrast. 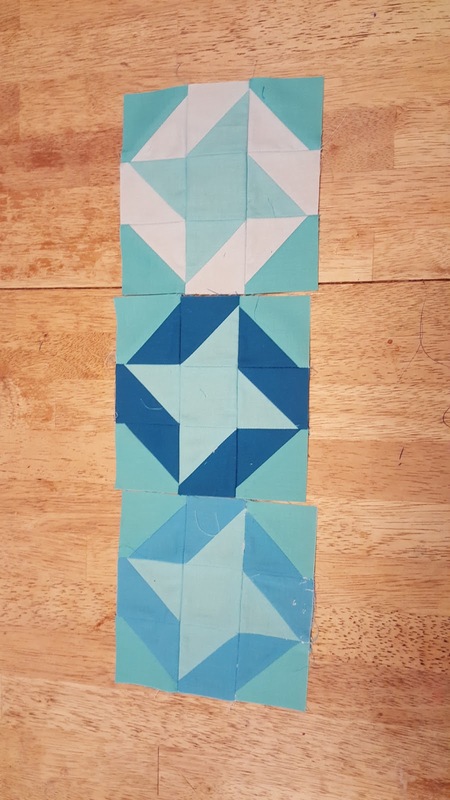 The idea is to use one block and change the fabric choices for different components of the block to see how it changes the over all look. 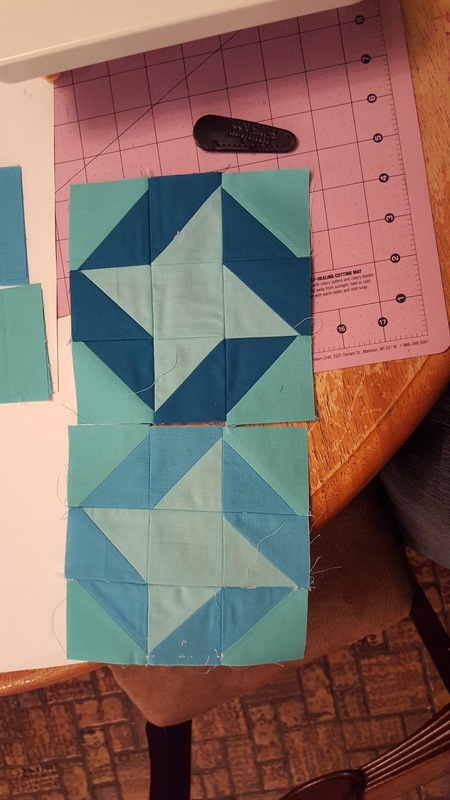 I wanted to choose a simple block since I wasn't planning on making a whole quilt and wanted it to be small. Then I chose my fabrics and got to it! This is the first of many contrasting blocks! 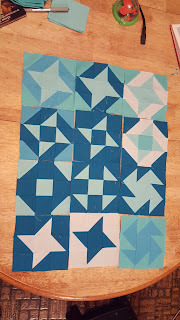 Once I got started making these blocks, I just couldn't stop! 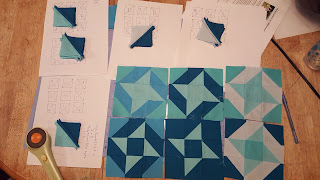 It was so much fun to see how each fabric choice changed the look of the block! I went overboard and made more than I needed! I kept everything organized by drawing out my plan and then stacking the fabric on top of each plan. With that, I could chain piece several blocks at a time! Not quite a complete set, but still a lot of blocks and many different looks! I got to work on Mercy's quilt and actually finished the third color section! Each section is quilted differently, with the light pink section quilted with "organic" lines and bubbles. I really like the way it came out, and a bonus was that it didn't take very long to complete! The blue name panel on the back shows the quilting very clearly. I love seeing the different quilting styles next to each other! I can't wait to see this quilt finished! I wanted to use up some decor weight fabric I had, so I made Mors Bags! I love how sturdy these bags are, and since making them, I have used them as library bags. I made several so the kids could have some too. For over a year, Keira has been going to Kid's Creek Therapy. First for speech, and later for physical therapy. She did a great job, learning a lot and working hard. But we had to stop going. On her final week, I took pictures of what she did and took a lot of notes so that we could work on therapy activities at home. When Keira first started the physical therapy, I had trouble understanding her therapist as English was not her first language. Over time, I learned how sweet, caring, and Godly she was. I was so thankful for her kind words and encouragement, and I miss seeing her every week! The therapist was working with Keira, but she had Sophia work with them too, in order to encourage Keira and show her what to do. The girls grew closer together and loved sharing this time. The therapy location had the greatest room! It had a tree house with elevated walk ways, a rock climbing wall, a ball pit, a sliding swing, and a bunch of other things like trapezes and punching bags. Kyle and Avalyn have been reading a lot of how to science books. They enjoy the Dangerous Book for Boys and Geek Dad books. After building the marshmallow guns, Kyle wanted to build a rocket. Adrian helped him build a water rocket. It was great fun to watch! The suspense was incredible, and the result was awesome! The kids originally set up on the porch. The kids quickly moved to the yard since the rocket was getting everyone wet! The pressure was almost too much for Sophia. She really struggled to pump up the rocket, but she managed to do it! Kyle loved the water rocket! He would have done it all day if we had let him! Avalyn had her turn with the rocket. I think the kids' favorite part was getting wet!